Day 105: We Got A Hot One Here! We all got going early this morning. Funyan, Meow Meow, Half Fast, and Red Blaze were all gone by 5:30am. Liz and I left at 6am. I just can’t set my alarm before 5am and it takes me about an hour to get ready and packed up in the morning. Gotta draw the line somewhere. We were leaving early for two reasons. First, we were 21mi from Seiad Valley and most of us had packages to pick up at the PO. Secondly, it was going to be HOT and the trail had a 6mi road walk through Seiad Valley with a HOT steep hike out of town. The hike into Seiad Valley was nice for the first 15mi. It was a gradual down and wooded. There was a to of poison oak to dodge. Our feet were feeling it from the last couple days, but it was the best we could ask for. Then we hit the road just after noon. HOT! My feet hurt and the sun was beating down hard. Our thermometers were reading upper 90s. 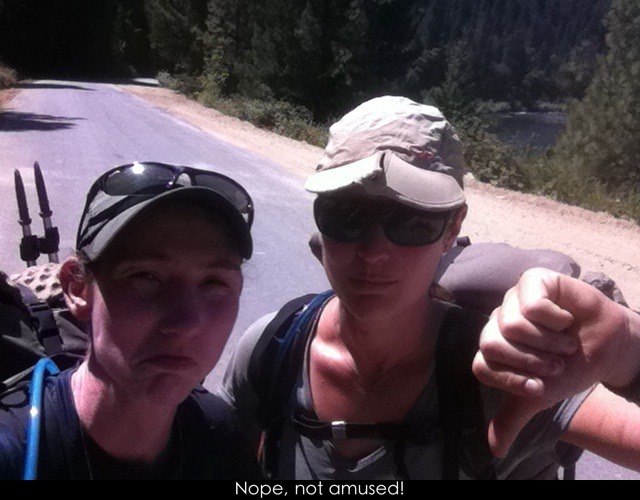 We were not happy hikers! We got to Seiad Valley around 3pm and I immediately got a chocolate milk. They opened the diner for us so we could have milkshakes. Liz and I had been using that as motivation all day. Then we all looked at our options for the rest of the day. We either hike 6mi up a very hot hill or hike about two miles to a spring. 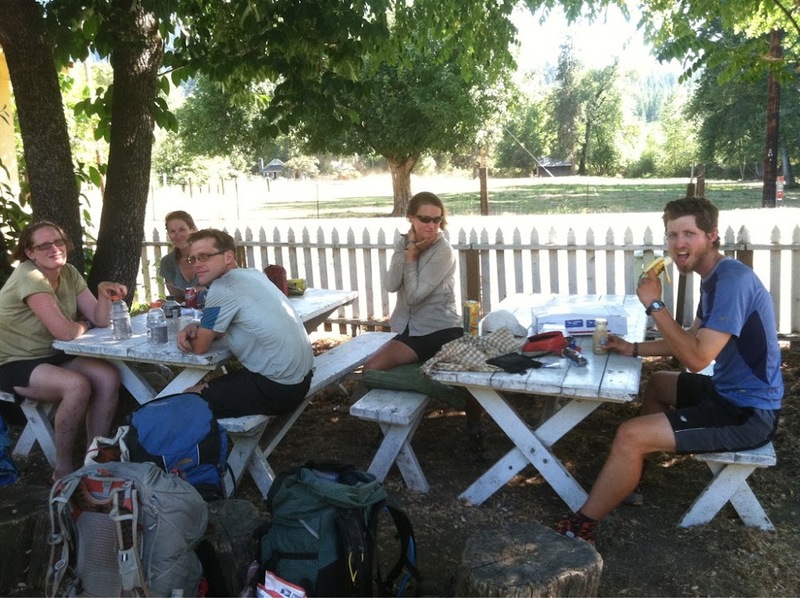 We realized it wouldn’t make much of a difference in our arrival to Ashland and we were all worn out from yesterday. We would rather add a little more miles to the next three days than suffer through the heat today. We hung out at the shaded picnic tables and I laid out on a sleeping pad on the ground taking advantage of the free wifi. Double yay! It really was HOT! I stepped out of the shade to test it out and could immediately feel my skin frying. Hmm, fry my skin or lay in the shade and watch an episode of Friday Night Lights? That’s an easy choice! It was great to get a break and be off my feet for an extended period of time. Even on our nero town days, we spend a ton of time on our feet doing errands. I haven’t had true extended time like this for awhile. I really needed it! Around 6pm everyone except me and Liz headed up the hill. We were wanting to wait as late as possible, so we left closer to 7pm. 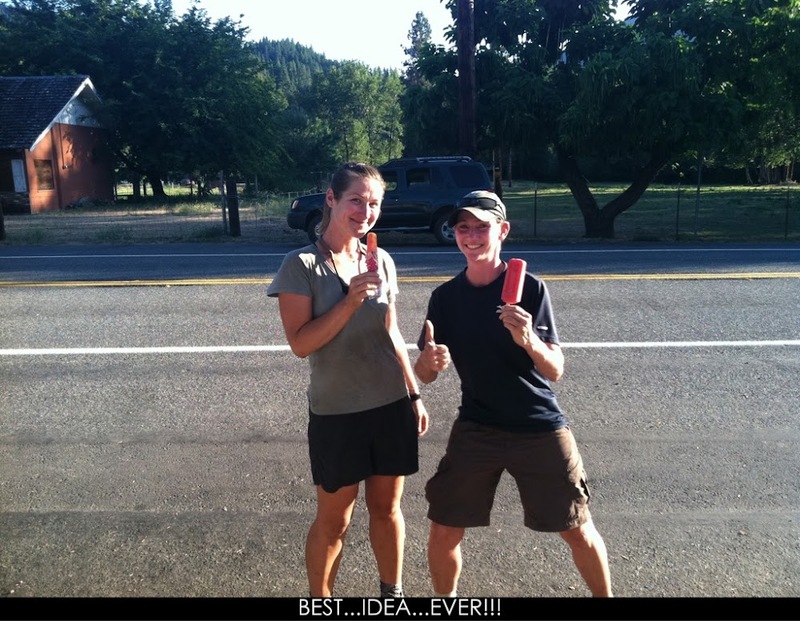 It was still 85 degrees so we got Popsicles for the walk which started on the road again. The books weren’t kidding when they said the hill out of Seiad Valley was steep. We were dripping sweat and we only hiked up the first mile of the hill. We camped with the others in a campground that is home to many mosquitoes, and is also a mine field of poison oak. If I don’t get poison oak, it will be a miracle! One final exciting note. Today we hiked far enough to now be less than 1,000mi from Canada. We’re down to the triple digits! The countdown is on!